On the Origin of Patterning in Movable Latin Type | In-depth information on the groundbreaking research into the origins of the harmonics, patterns, and dynamics in roman and italic type, and on the resulting software for the parameterization of related design processes. Best online casinos for usa players https://slotsdad.com/slots-basics/online-casinos-for-usa-players/. Play live roulette online https://roulettegames.live/. This blog provides information related to Dr. Frank E. Blokland’s PhD research at Leiden University, mostly presented as ‘notes on’. The subtitle of this research, which lasted from October 2006 until October 2016 and resulted in this dissertation, is Renaissance Standardization, Systematization, and Unitization of Textura and Roman Type. Prof.dr. Adriaan van der Weel and Prof. Frans de Ruiter were Blokland’s supervisors. Short animation by former EcTd-student Nicolas Portnoï showing digital glyphs and character widths distilled from matrices of Robert Granjon’s Ascendonica Romain (or Double Pica Roman or Gros Parangon). In the practice of the present-day type designer there seems to be quite some emphasis on technical matters, especially on (the standardization of) of font and related data-storage formats. Perhaps this was also already the case more than 500 years ago. Blokland’s research is conducted to test the hypothesis that Gutenberg and consorts developed a standardized and even unitized system for ‘designing’ and casting textura type, and that this system was basically extrapolated for the production of roman type in Renaissance Italy. For this, Humanistic handwriting was literally molded into preﬁxed standardized proportions. This research proves that technical matters from the Renaissance font production directly inﬂuenced the proportions of roman and italic type, and hence the related conditioning that forms the basis of our perception. Blokland’s research not only provides more insight into the origin of Latin (movable) type, but the outcomes can also be used for the production of present-day digital type, and even for the parametrization of type-design processes. This blog provides practical information and software for applying adjustable patterns based on the ones distilled from the archetypal models for roman and italic type. of which the algorithm was developed by Blokland based on his research outcomes. The acknowledgement of the central place of the pen in the historical development of type and hence the importance of (knowledge of) writing for the designing of type has been always shared by many in the ﬁeld. There is not much discussion possible about the fact that written letters were initially standardized and eventually formalized by the Renaissance invention of movable type. Berthold Louis Ullman notes in Ancient writing and its inﬂuence (New York, 1932) that the early printers based their fonts on the writing that was current in books of their day. According to Ullman they imitated it as closely as possible so that their product might not suffer by comparison. This mimicking may have been the case for books printed in Textura types like for instance the ones by Gutenberg, and Fust and Schöffer. After all, the written Textura Quadrata was a perfect model for justifying and casting, because it made the equal distribution of space between the letters when placed on rectangles quite simple. 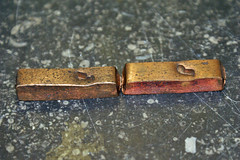 Also the number of character widths can be limited, which makes for instance casting with ﬁxed-width moulds possible. 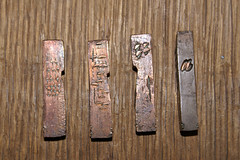 Standardizations and systematizations could have been relatively easy applied on different levels: on punches, matrices, and the casting of Textura type. The transition from the handwritten Humanistic minuscule to roman type, and later from Humanistic cursive to italic type, must have been more complex than the transition from Textura writing to Textura type if writing was taken literally as basis. But it is actually hard to trace a literal interpretation of Renaissance handwriting in early roman type. Some standardizations in the roman type by for instance the Da Spira brothers and Jenson actually look like the ones in Textura type. Producing roman type with the same scheme in mind as was used for casting the morphologically related Textura type deﬁnitely would have helped to simplify matters. The hypothesis for this research is that such an approach requires a standardization of the proportions of type, not only in horizontal direction for the characters and their widths, but also in vertical direction for x-height, ascenders and descenders, and capital height. The horizontal and vertical dimensions in type are inextricably related. Basically this could imply that Renaissance type was made on prediﬁned proportional system, which not only made the design part, i.e., the cutting of punches, easier, but also the justiﬁcation of the matrices, the casting of type, and the justiﬁcation of text. 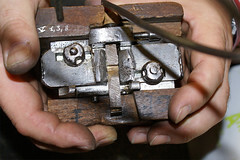 If the existence of systematizations can be proven, this would also help to explain the transition of a profession practiced initially by only one person, i.e., the punch cutter, who manufactured the punches, matrices, and cast the type, into basically three parts: punch cutting, matrix manufacturer/justiﬁer, and caster. The distribution of type all over Europe must have been easier in case spacing-intelligence (an extrapolation of the standardization of character-proportions) was included in the matrices. TYPO Labs 2017: How archetypal patterns can improve (the production of) digital type. The regularity of the written Textura Quadrata made it relatively easy for Gutenberg and consorts to standardize and systematize their movable Gothic type, which was directly based on its written precursor. This standardization and systematization resulted in a calculable horizontal structure, and a translation of this into fixed vertical dimensions (in handwriting vertical boundaries are not very strict). When this was accomplished, it was obvious to apply the same system to the new roman type (and decades later to italic type). In contrast to the generally embraced theory that ‘the mythical eye’ of the Renaissance punch cutters interpreted handwritten Humanistic models, are roman and (and to a lesser extent) italic type the result of this standardized process. What we find optically appealing in Latin type is actually partly the result of standardizations applied during the fifteenth-century font production. Our ‘eyes’ are conditioned with the outcomes, and due to this we consider the roman and italic types from the early days of typography amongst the very best still. – How were the structures of textura type translated to roman and later italic type? – How were the handwritten models standardized for roman and italic type? – To what extent was the Renaissance font production systematized? Did the punchcutters for instance apply relatively sophisticated forms of unitization? – Did such standardization and systematization preserve optical preferences for form, rhythm, and harmony (distilled from the handwritten origins), or did they create newones due to the forced grid fitting of the written letters, transforming a new basis for the conditioning of ‘the eye’? – How does this theory relate to the generally embraced one, in which the eye of the punchcutter seems to have been the deciding factor, and calligraphic models the templates, and in which Jenson, Griffo, and Garamont, of whom the first was an engraver and the other two were goldsmiths, are subsequently more or less considered type designers? – Why is it that seventeenth and eighteenth-century descriptions of the type founders’ practice by for instance Moxon and Fournier do not mention the aforementioned extrapolation of the textura model, and subsequent standardization of proportions and widths of characters? – Could there be a direct relation to different ﬁtting methods for type, such as the appliance of ‘set patterns’, and the deviations of Renaissance proportions in later roman types, such as due to the ‘goût Hollandais’? – If proportions and structures of Renaissance textura, roman, and italic type are the result of standardization, is it –after mapping this standardization– possible to analyze and reproduce related parts of the type design process artificially? If so, what does this tell us about the creative part of the type design process, in which –as mentioned– many believe that the eye rules? The central argument of Blokland’s dissertation is that the harmonic and rhythmic rules for grapheme systems and subsequently for typography, and the related conditioning, which forms the basis for the ‘mythical eye’ of the type designer (or ‘the supreme judge’, as Pierre Simon Fournier named it in his Manuel Typographique [1764–1766]), always are relative to the applied models. The underlying patterns of these models are the result of evolution, changes in taste, and (the moments in history of) technical innovations. What is considered to be harmonic, rhythmic, and esthetical in type is merely the result of conditioning, i.e., cultural habituation, of their creators, i.e., type designers, their appliers, i.e., typographers, and their users, i.e., readers. If harmony and rhythm would be absolute matters, there wouldn’t be so many differences between scripts. In case of the Latin script, graphemes were formalized and ﬁxed by the Italian Renaissance punch cutters Nicolas Jenson and Francesco Griffo. 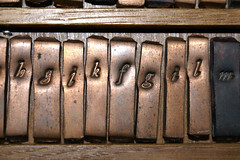 Their archetypes were, and still are –directly or indirectly– the prototypes for later variants, such as made by for instance by the 16th-century punch cutter Claude Garamont, the 17th-century punch cutter Christoffel van Dijck, and the 20th-century type designer Jan van Krimpen, just to name a few. The way type designers, typographers, and readers look at type is subsequently also ﬁxed by forenamed Italian Renaissance punch cutters. Note: the Garamont model is still preferred ‘today as the most natural and invisible of typefaces’, as Prof.dr. Vervliet wrote in the Journal of the PrintingHistorical Society in1965. As such this is perhaps a bit curious, because one would expect that over time the model would become more crystallized and sophisticated, and therefore more preferred. This is clearly not the case with the models from Garamont and his Italian precursors, which we, as mentioned, are so much familiar with. In the dissertation all facets of harmony in formal representations of the Latin script are described. This is basically unexplored territory. The underlying structures of type in use since the moment that the invention of movable type was introduced in Italy in the ﬁfteenth century have not been coherently mapped so far. Attempts have been made to capture letter forms into geometric models, like the reconstructions of the Roman imperial capitals by for instance Felice Feliciano, Luca de Paciolli, Albrecht Dürer, Giovan Francesco Cresci, and many other Renaissance artists, calligraphers, and scholars. There were also the geometric patterns by the Académie des Sciences for the construction of roman type during the passage from the seventeenth to the eighteenth century. However, these Renaissance and Baroque pattern-descriptions were absolute, i.e. they were meant to describe and deﬁne certain letter forms via outlines created with ruler and compass. The mutually different patterns for basically the same capital letter forms from Feliciano and consorts, and later the ones by Jaugeon’s committee for roman type, did not serve as generic models for describing the underlying structures, but their purpose was to provide speciﬁc construction methods for speciﬁc letter forms. So, the structure of these letter forms were ﬁxed and the patterns were not meant for further modiﬁcation. By contrast the present research comprises the development of software for parametrized type design, and for measuring and analyzing (digital) type and typography. As mentioned, this site provides some more insight into Blokland’s research, and it reveals a couple of the models and patterns he developed over the years. Digital microscope (actually meant for checking computer boards) with matrix of Garamont’s Gros Canon Romain. Photos taken with this microscope were used for the masthead-illustration. Some of the models that also can be found on this site are purely theoretical, and others are the result of empirical research. For distilling information from historical type, like proportional and rhythmic systems, Blokland measured punches, matrices, prints, and even digital revivals. For measuring standardizations of width and possible unitizations of matrices and type, only the research of this metal material makes sense, of course. For measuring the proportions within the body, i.e. the relation between the x-height of the lowercase, the capital-height and the length of the ascenders and descenders, punches, matrices, prints and also meticulously made revivals can be used. 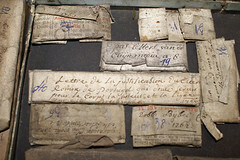 To prove the application of standardized widths in Renaissance type Blokland started measuring type by Claude Garamont and Hendrik van den Keere in the collection of the Museum Plantin-Moretus. Although this type is attributed to the 16th-, or at latest the 17th-century, it is not possible to be completely sure about the age. For dating the C14 technique can’t be applied, because there is simply not enough carbon in the alloys. Basically this problem was of limited importance for Blokland’s research, because the idea is that the standardization of the matrices determines the widths of the cast type, but to circumvent it completely type was cast from the original 16th-century matrices. For those who consider Blokland’s research to be primarily focused more on the technical fundamentals of type design than on the artistic aspects, it is perhaps good to know that he is by origin a calligrapher, lettering artist, and type designer. The small –relatively arbitrary– selection from Blokland’s œuvre presented in his biography, proves his work never suffered from dogmatically applied patterns and grids, although sometimes the use of these was unavoidable. It should be noted that although Blokland has formal permission from his Dean and his supervisor to publish material from his research here, the information provided is not in any way ofﬁcially approved or endorsed by Leiden University. Some of the (in the meantime updated) information provided here has been published earlier on for instance the Typophile forum, and on the ATypI members list. Also some of the theories and images were presented by Blokland during talks at conferences on type and typography, such as the ATypI conferences in St. Petersburg (2008), Dublin (2010), and Reykjavik (2011), and at the Type[&]Design 2009 conference in The Hague. From the moment on I posted some information on my research on the web and talked about it at conferences, I received positive comments, but predictably and inevitable also a couple of negative ones. Concerning the negative reactions, especially some type designers pointed out to me that I underestimated, or even misunderstood the type designer’s ‘eye’, and that my measurements were not very useful in general. One type designer wrote on the Typophile forum: ‘[…] I don’t think you will learn much by taking pictures of sheep and nuts and measuring them […] I don’t think the measurements of Jenson etc. are that relevant either […].’ If one wants to understand the fundamentals of type design, measurements of the archetypes are very relevant, I think. In case of the dynamical (e)m- and (e)n-squares I distilled from Renaissance type, there were some initial reactions of designers who considered the 1:1 appliance of the geometrical systems impossible on punches. I reckon that there was indeed no nanotechnology available in the Renaissance that made this possible, but as I point out on this site, the punch cutters could have calculated the proportions at a large size and subsequently could have scaled down the outcomes to the size of the punches. The proportions could have well been translated into a units, like I show in section 3.1.1 Notes on the origin of (e)m- and (e)n-square. Also not all type historians I had contact with are convinced that researching standardizations and systematizations in the Renaissance production process of movable type makes sense. Let me ﬁrst make clear that I am not a type historian; I am more a sort of a type archeologist. I excavate, distill, and reconstruct using my thirty years experience as type designer. It will not come as a surprise that based on my measurements and distilled models and casting, I very much doubt that the spacing was by deﬁnition always ‘done by judgement of the caster’. I believe that prior to the use of ‘set patterns’, the spacing was an extrapolation of the standardization of character-proportions. When it comes to practical usage of my ﬁndings, the models as shown on this blog will be applied in software for analyzing type and in software for designing type. So, there will be no isolation from the shop ﬂoor in this case, and this fact makes my reserach deﬁnitely part of the real world, I reckon. But let me underline here that I am just exploring and investigating, and that I welcome any solid evidence, which proves that I am wrong; what I state here is not untrue until proven to be untrue. So, basically this blog should also be considered as an invitation to discuss my ﬁndings. A recurrent argument against my hypothesized regularizations of Renaissance movable type, is the complete lack of documentation on type founding from that time. One can actually use the same argument against everything that has been written so far on the subject, and which seems to be based on the projecting of the 17th and 18th century documentation on the subject on the earlier centuries. My measurements of historical material and the actual casting from renaissance matrices seem to underline the correctness of my thesis so far. Finally, it is tempting to imagine that it wasn’t purely a coincidence that movable type was invented in the time of the rigid Textura Quadrata. As it is tempting to speculate that the early German type founders already took into account the fact that the system used for Textura type should be useful for other representations too at a later date? Then the body or em-square had to be deﬁned in such a way that it could serve both Gothic and Humanistic type. And like it is the case for the PostScript and TrueType em-squares for digital type, it is not unlikely that the early punch cutters deﬁned the proportions in a format that was independent from the measurement systems in use at that time. But this is not more than a footnote, because it is a bit off-topic.